In this article we will address the main issues on amniocentesis, including indications, procedure description and possible complications. The known bag of water, which breaks down at the beginning of labor process is a membrane-shaped bag filled with liquid, in which the fetus is inserted throughout pregnancy. The bag of water is called by doctors amnion or amniotic sac. The volume of amniotic fluid in the amnion grows as the baby will develop. 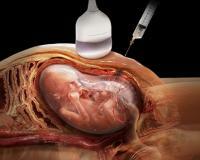 Around the 28th week, the volume of amniotic fluid reaches its limit, which is somewhere around 1000 ml. Amniotic fluid is important for the normal development of the fetus, as it helps keep the baby warm, prevents large and sudden variations in temperature and serves as a buffer for trauma in the womb. Amniotic fluid also allows the baby to move easily inside the uterus, enabling the development and strengthening of the muscles and bones. The puncture of the amniotic fluid by amniocentesis, a procedure called can be useful for intrauterine diagnosis of genetic diseases because this fluid is rich in cells of the fetus itself. The fetal cells present in amniotic fluid have the same genetic material from any other cell of the baby, i.e. the DNA present in the amniotic fluid is the same DNA from fetal cells. Therefore, to obtain amniotic fluid samples, we make a detailed genetic evaluation of the baby. With the evaluation of the fetal DNA can determine if the baby has chromosomal disorders such as Down syndrome (trisomy 21), Edwards syndrome (trisomy 18), the Patau syndrome (trisomy 13) syndrome Turner (monosomy of the chromosome X), Klinefelter syndrome (XXY) and several others. Blood diseases of hereditary origin, such as sickle cell anemia, hemophilia or thalassemia. Developmental defects of neural tube such as spina bifida or anencephaly. After the 32nd week of pregnancy if there is a problem pregnancy induction of labor prematurely become necessary, either to prevent maternal or fetal complications, amniocentesis can be performed to assess the degree of maturation of the lungs. If amniocentesis point already mature lungs, the baby's risk of breathing difficulties at birth is lower. If the results point to a lung immaturity, doctors need to administer drugs to accelerate maturation of the lungs before inducing labor. Amniocentesis can also be used as a treatment in cases of polyhydramnios, which is the name given to the excess of amniotic fluid in the uterine cavity, usually over 2000 ml. In this case, the procedure is called esvaziadora amniocentesis (or evacuadora), and the liquid volume is drained from 500ml to 1000 ml. Amniocentesis allows us to identify the baby's gender with 100% accuracy. However, as there are simpler methods to identify fetal gender, such as ultrasound or fetal sexing through maternal blood, no one calls for an amniocentesis only in order to identify the baby's gender. Amniocentesis is an invasive procedure and, as such, may have some complications. So, despite being extremely useful, it is not given indiscriminately to all pregnant women. Maternal age greater than 35 years. Changes in screening tests for genetic diseases in the first quarter, as the blood tests or fetal ultrasound. Family history of genetic disorders. Previous pregnancy with some malformation or genetic abnormality. Severe intrauterine growth restriction of the fetus. In countries where the legislation allows abortion in cases of malformations, amniocentesis is an important tool for early diagnosis of problems in pregnancy. In countries like Brazil, however, abortion is not permitted by law in the vast majority of cases, which makes the result of little use amniocentesis in many situations because the doctor has no power to terminate a pregnancy, even if the fetus has severe malformation. The importance of examining just being restricted to early clarification of the family about the health problem that your baby will have. In addition, the family when there are conditions, you can contact a team of experts and a neonatal intensive care unit for delivery. The most suitable time to perform the amniocentesis is between the 15th and 17th week of pregnancy stage where there is already significant volume of amniotic fluid, but the baby is still small, with less risk of needle hit it. Amniocentesis is a simple and fast procedure, lasting a few minutes, which can be done in own obstetrician's office. Amniocentesis involves inserting a thin needle and long in the abdomen, with the goal of reaching the uterine cavity. 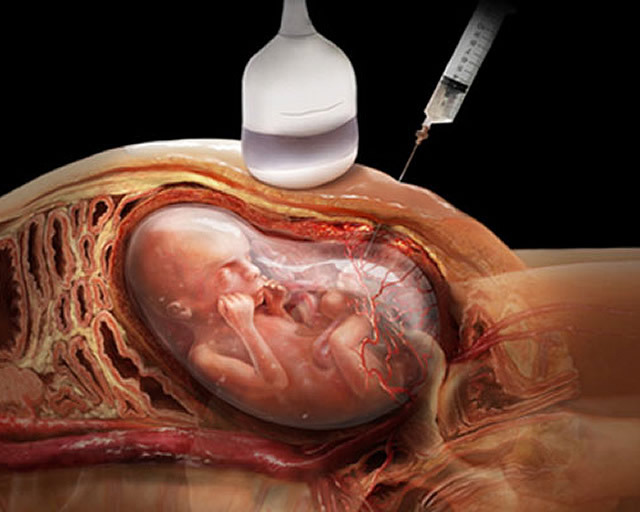 The introduction of the needle is guided by an ultrasound so that the doctor can identify a location within the uterus that is far from the fetus and placenta, but rich in amniotic fluid. Upon arriving within the amnion approximately 15 to 20 ml of liquid are aspirated with a syringe attached to the needle. As the needle used is very fine, the procedure causes very little pain in the majority of cases. Most women refer more pain when they go to the lab draw blood than amniocentesis. Therefore, usually, any kind of anesthetic is not necessary. But pain is a very personal feeling, and some people, especially those more anxious, often barely deal with procedures involving needles. In these cases, specifically, a bit of local anesthetic can be made. Although the anesthetic itself hurt itself more than amniocentesis, it is better that the patient gets stirred for anesthesia of the skin than when there is a needle within their uterus. After obtaining the desired amniotic fluid volume, the needle is withdrawn and no need to compression of the puncture area. After transferring the liquid to the tubes to be sent to the laboratory, the obstetrician makes a new fetal ultrasound to see if the baby's heartbeat is normal.